. : Optics & Photonics Focus :: Charge Goes Up, Charge Comes Down :. Beyond what is naturally possible... metamaterials offer new unexplored opportunities to manipulate light. Researchers show the possibility to enhance the index of refraction of a material beyond natural limits. Art masterpieces reveal surprising facets when we look at them through different eyes. Visible light is not always enough to disclose all of the details they hide. Use thermal radiation, however, and a good deal of their mysteries can be unveiled. The unsteady world of a Brownian particle. For a microscopic particle, life is quite an adventure. Molecules come and go from its surface incessantly and its charge continues changing. Measuring these charging and discharging events is quite a challenge, which has now been met. If you were a microscopic particle immersed in a liquid, the world would look very different. You would find yourself worrying about all sorts of other things such as, for example, the number of electric charges close by, and how these come and go. As a matter of fact, all of this frenetic activity happens to be central to many of our everyday technologies, such as printers and electronic books. 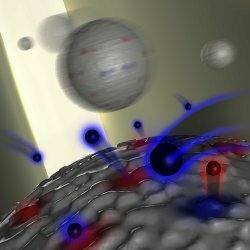 Filip Beunis and colleagues from Ghent University in Belgium and also from ICFO-The Institute of Photonic Sciences in Barcelona, Spain, have been able to observe the loading and unloading of electric charges on a microscopic particle in real time, using a sophisticated experimental technique. Life as a microscopic particle can be quite unsteady. Microscopic particles are constantly jiggled around by the fluid molecules surrounding them, zigzagging, as a result, with a characteristic random motion known as Brownian motion. But this is not all. The murky borderland, as it were, between the particle and the fluid is in a state of perpetual metamorphosis. There, the particle surface and the fluid compete for the molecules and the electric charges floating around. The fate of this never-ending battle depends on the specific conditions of the environment, such as, for example, the temperature, or the presence of salt. Surprisingly, such fate plays a major role in a lot of the technologies we take for granted today, from ink color printers to e-book readers. Naturally, scientists and engineers have been very interested in studying this battle as it unfolds. This, however, is no easy task. One needs to be able to detect when a single elementary charge is captured by the particle and when it manages to escape. This implies being able to detect the presence of a single elementary charge attached to the particle surface — and a single elementary charge is really small. Furthermore, this needs to be done fast, before the next charging or discharging event happens. "To measure changes of a single elementary charge on a particle," Beunis expains, "two conditions must be fulfilled: first, we have to measure the particle charge with an accuracy better than the electron charge, and second, we have to measure the particle charge faster than the time between consecutive (dis)charging events." To perform this kind of experiment, Beunis and his colleagues employed a sophisticated technique: they placed the particle between two electrodes, where an oscillating electric field was also present. To prevent the particle from drifting away as a result of its Brownian motion, and to keep it in place, they used an optical tweezers — a focused laser beam that permits the trapping and manipulation of a microscopic particle. The oscillating electric force causes the particle to oscillate in the optical trap with an amplitude that depends on its charges. In this way, each time an elementary charge is captured, for example, the amplitude of the oscillations increases. The main challenge Beunis and his colleagues were faced with was in achieving enough sensitivity to detect the minute amplitude change associated with a single charging or discharging event. For example, one could increase the electric field intensity, but this would cause a series of troublesome side effects, such as chemical reactions at the electrodes, which would effectively destroy the experimental sample. The alternative approach was to measure the particle’s oscillations for a longer time, which permitted them to average out the noise associated with the Brownian motion of the particle, but they could not measure arbitrarily slowly, because eventually a charging or discharging event happened. "The challenge was to find the right measurement parameters to fulfill both conditions," Beunis concludes, "without knowing in advance the characteristics of the (dis)charging process." Using this technique, Beunis and colleagues were able to detect single charging events as they were happening. They discovered that a few charging events happen each second according to a very well known probability distribution if a PMMA microparticle — a microscopic sphere made of a plastic commonly used for kitchen utensils — became immersed in the type of oil known as dodecane. Of course, this is a rather peculiar system, but Beunis and colleagues are now planning some follow-up experiments on more common systems, such as aqueous systems. Such systems, however, pose big challenges, of which "the most important one," as Beunis clarifies, "is that particle charge is typically much bigger in polar liquids [water] than in nonpolar liquids [oil], and because of that the average time between individual charging and discharging events is much smaller. In our experiment, it was sufficient to measure the charge 25 times per second to catch individual charging events, but in polar liquids, a much faster measurement will be needed. Faster means less accurate, and the only way to compensate for that is to use a higher electric field strength. This will in turn introduce other problems, such as electrolytic reactions at the electrodes." Where several technologies are concerned, ranging from electrophoretic ink displays to liquid toner printing, it is becoming increasingly important to control the charge on microscopic particles: "There is already a lot of empirical knowledge on how to do this, but at this moment the underlying physical and chemical processes are not yet understood." And, looking more into the future, together with Beunis we can "imagine a particle coated with receptors for a specific kind of biomolecule, in such a way as to be able to monitor the particle charge changes when a biomolecule binds; this would be a very sensitive probe for biodetection." GV is Assistant Professor at Bilkent University in Ankara (Turkey); his research focuses on optics, statistical physics and soft matter (http://softmatter.bilkent.edu.tr/). Filip Beunis, Filip Strubbe, Kristiaan Neyts & Dmitri Petrov, Beyond Millikan: The Dynamics of Charging Events on Individual Colloidal Particles, Physical Review Letters (2012) 108, 016101 (link).